Another good historical romance to read on these wet dreary days in Inishowen. Although the third in the series, it works well as a stand-alone. I haven't read the others and I really enjoyed it. Sophie Russell, once a sought after society’s darling, is disgraced after a scandal involving her father and his untimely death. She and her sisters lose the family home. The three ladies determine to prove their father innocent of the crime he was accused of. Sophie suspects the new owner of her home, Viscount Griffiths, is the real villain and so decides to investigate. She poses as the new cook with the aim of spying him. 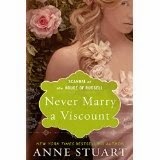 Viscount Griffiths, however, mistakes her for a mistress he hired sight unseen from an establishment in London. And so, this leads to many comic scenes and banter with lots of double entendres for the reader to chuckle through. The villain in the story is not difficult to detect but the journey the reader takes along with Sophie is enjoyable and includes some good suspenseful scenes.